In 1976 New Zealand’s GDP per head was 5% below Australia’s, in 2006 it was 26% below. What is GDP, how does it relate to national income, and what else can such measurements tell us? The three key ways of measuring the economy are the gross domestic product (GDP), the gross national expenditure (GNE) and the gross national disposable income (GNDI). GDP is the value of all the goods and services produced, usually per year. Education and health, and other services which are provided free or subsidised, are measured by how much it costs the government to provide them. It would be difficult to measure GDP if some goods or services were recorded more than once, for example if flour sold to a baker was recorded, and then the price of a loaf of bread was also recorded. GDP only records ‘final’ goods, such as the price of bread. Only goods and services made in New Zealand are counted. GDP provides useful information about how the economy grows or shrinks over time. If prices are rising, economists can adjust GDP so it shows the real (volume) change in the economy. In the 1970s GDP appeared to grow by 14% each year, but once it was adjusted for inflation the real growth was only around 2%. 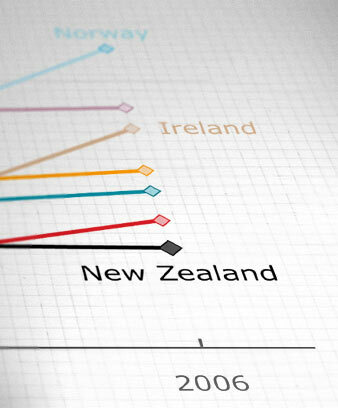 It is relatively easy to compare New Zealand’s GDP growth with that of other countries because economists usually compare the rates at which GDP changes rather than GDP levels. They also prefer to look at GDP per person to allow for population changes. But if people want to compare the sizes of two economies, it is not as simple as converting the GDP of one into the currency of the other, because currency exchange rates are affected by things like currency speculation. Instead purchasing power parities (PPPs) are used: if the same basic household items cost NZ$30 in New Zealand and A$20 in Australia, then the PPP would be 1.5. In 2006 the PPP between New Zealand and Australia was 1.08. In 1976 New Zealand’s GDP per person was 5% behind Australia’s but by 2006 it was 26% behind, and New Zealand had slid to 22nd out of the 30 modern economies that belong to the OECD. Some income from goods and services made in New Zealand is sent overseas to investors, and income also flows into New Zealand from money invested overseas. The gross national income (GNI) includes money flowing in, and deducts money flowing out. In the 1970s the GNI was 98% of GDP, but by the 1990s it was 93%, as New Zealanders borrowed more overseas money. If money like foreign aid, insurance claims and remittances (money people send to relatives in other countries) is taken out of the GNI, this gives the gross national disposable income (GNDI). If things like the wear and tear on buildings and machines are deducted from GNI, this is the net national disposable income (NNDI). This is a good measure of the net income New Zealanders have to spend or save. In the 1970s workers got 63% of NNDI, but this dropped to 53% in the early 2000s – businesses got an extra 3% and the government took an extra 7%.